The popularity and craze of crossword puzzles haven’t lowered down even a bit since its inception way back in 1913. But, what’s this hullabaloo all about? Isn’t it just another game? No, it isn’t. In fact, more than 100 years of history and a rich heritage of words that’s fun, entertaining, engaging and absolute love – that’s what crossword puzzles are all about. Pretty exciting, isn’t it? Now, having said that, it’s not just the fun part that makes crossword puzzles oh-so-enticing, there’s a lot more to these amazingly crafted online crossword puzzles. Curious to take a sneak peak? Well, why not do it with certain facts? Fair enough, right? So, it goes like this; based on a Irish study done on a group of university students, it was found that students who solved crossword puzzles daily for a continuous duration of 4 weeks reflected significant improvement in their verbal and communication skills than compared to those who didn’t indulge in any such puzzling activities. Now, that’s amazing! So, you see, how the mental stimulation which goes in bringing words together while solving a online crossword puzzle improves your vocabulary and word power considerably? Wouldn’t it help you take your personal and professional life a notch higher? After all, good vocabulary and seamless communication skills contribute significantly in the overall development of a confident and successful personality, doesn’t it? Moreover, with the explosion of word puzzles online (all thanks to the technology), the world of crosswords have only got bigger and better. Bigger in terms of variety and better in terms of prizes. Yes, you heard that right! Gone are those days when solving a paperback crossword puzzle games just gave you instant gratification. With time, the crossword puzzles have changed and so have its results. Now, apart from satisfying your mental cravings, the new age online crossword such as Wealth Words also gives you enormous cash prizes to take home. Now, this is one grand news, isn’t it? Imagine diving in its intelligently designed web of words and winning great cash prizes while improving your word power just through a click. Sounds so cool, right? Eager to try your luck at Wealth Words? Well, mind you, luck isn’t really a factor for winning big here. All you need is a little concentration and focus on grasping clues that come your way and you are good to go and crack the puzzles while laughing all the way to bank, quite literally! So, get going, register at its website, purchase tokens worth $2 each to play your heart out and make all its divisional cash prizes yours. Yes, the cash prizes at Wealth Words are distributed in the form of division 1 and division 2. A total of 20 puzzles needs to be solved correctly for acquiring these cash prizes. If you answer all the 20 puzzles right, you get division 1 cash prizes and if you happen to be on the next highest correct answer position, you get to take division 2 cash prizes home. However, just make sure to be quick enough to submit your answers in an active time frame of an hour to find your way in the ultimate race of winning huge cash prizes. 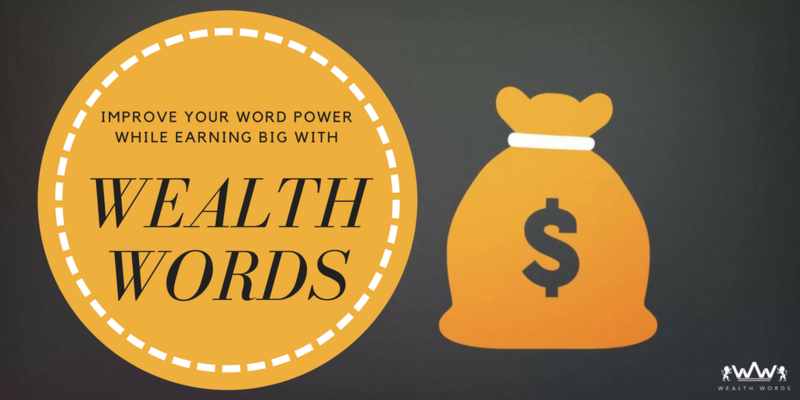 In fact, there are even bigger and better pool of cash prizes at Wealth Words where its plethora of short and active word games for 2 to 20 words can help you win cash prizes as high as a whopping $2000. Rolling your eyes already? Hi five! I can feel you, folks! So, bring out your inner wordsmith and play amazing online crossword puzzles anywhere and anytime while having an improved word power, warm pocket and a heart full of happiness. What else one could ask for? And, by the way, if you wish to hone your puzzling skills before taking this crossword plunge, you can go for the open game at Wealth Words and practice it out without any registration or token purchase. Such user-friendly approach from an impeccable online crossword is much appreciated, right? So, happy puzzling, folks!